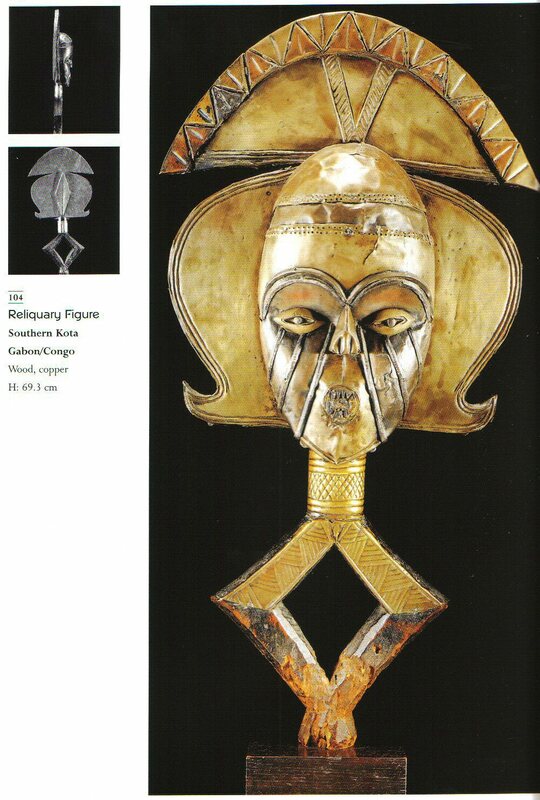 cultures, and becomes part of the treasures from all places and all times of human creation. part of the Paris-based Nouveau Realisme, or New Realism, movement and his American wife Corice Canton. 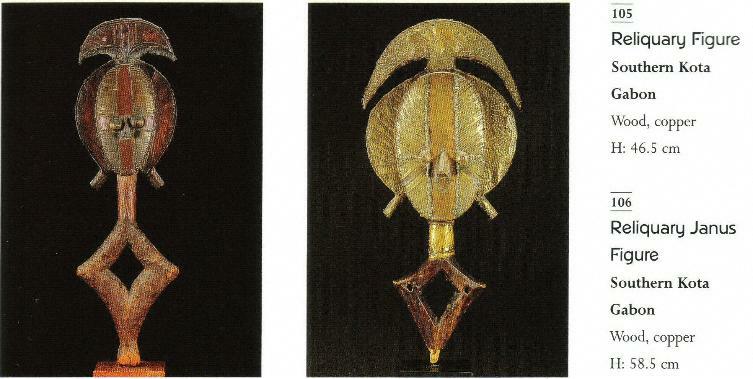 and beautiful African objects together for the first time. Roy, Louis Perrois, Alain Nicolas, Gustaaf Verswijver, Luc de Heusch, Els DC Palmenaer, and Jacques Lombard. of the objects and the peoples that produced them, including historical, religious, and geographic information. Shamaye, on the other, as well as some other small groups of lesser demographic importance. also would carefully keep them out of the reach of other villagers. one again finds the two types of organization, patriarchal in the north, matriarchal in the south. Wood, copper; H. 39.8 cm. Wood, copper; H. 33.7 cm. Wood, copper; H. 42.6 cm. Publications –F/ Chaffin. 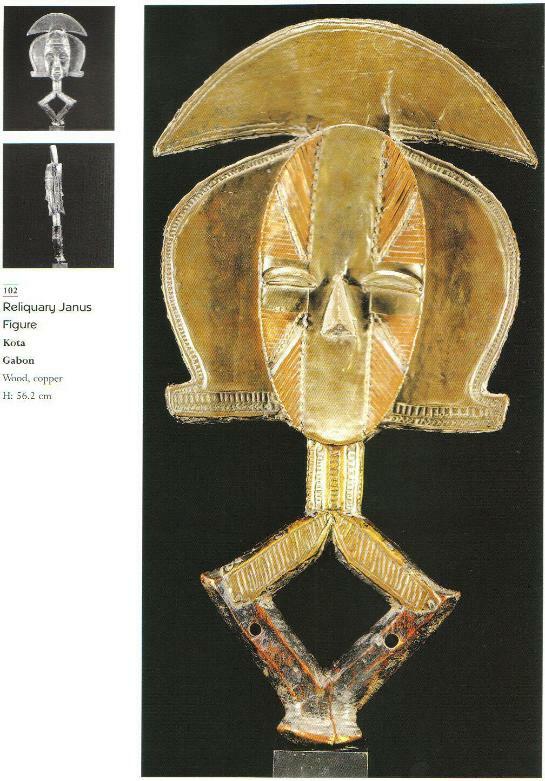 L’Art kota, p. 98, no. 21. Wood, copper; H. 58.9 cm. Wood, copper; H. 62 cm. Wood, copper; H. 44.5 cm. Wood, copper; H. 68.5 cm. Wood, copper; H. 45.7 cm. Wood, copper; H. 54 cm. Wood, copper; H. 64.2 cm. Formerly in the R. Duperrier Collection. Arnouville, 1979, no. 221 a and b, p. 216. -F. Chaffin, I Art kota, p. 306, no. 189. Wood, copper; H. 58 cm. Wood, copper; H. 42.7 cm. -F. Chaffin, L'Artkota, p. 224, no. 12S. Wood, copper; H. 49 cm. Galleries, New York, catalogue n° 203. -F. Chaffin, L'Art kota, p. 140, no. 2. Wood, copper; H. 56.2 cm. Sale of the De Mire Collection, Dec.
Wood, copper; H. 61.8 cm. 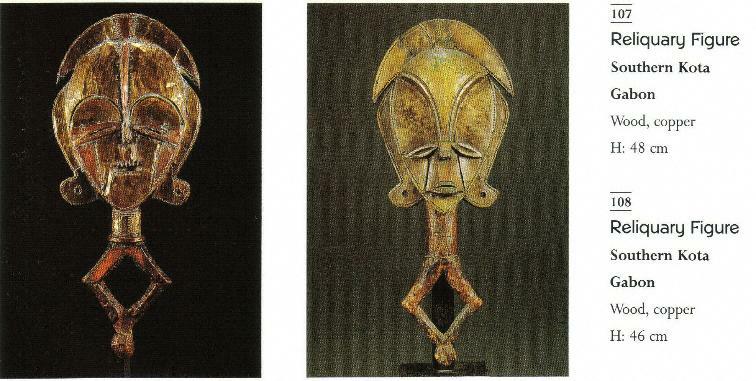 -Werner Gillon, Collecting African Art, 1979. -F. Chaffin, L'art kota, p. 204, no. 104. Wood, copper; H. 46.5 cm. Galleries, New York, catalogue n° 200. Wood, copper; H. 48 cm. Wood, copper; H. 46 cm. Wood, copper; H. 37 cm. Wood, copper; H. 24 cm. 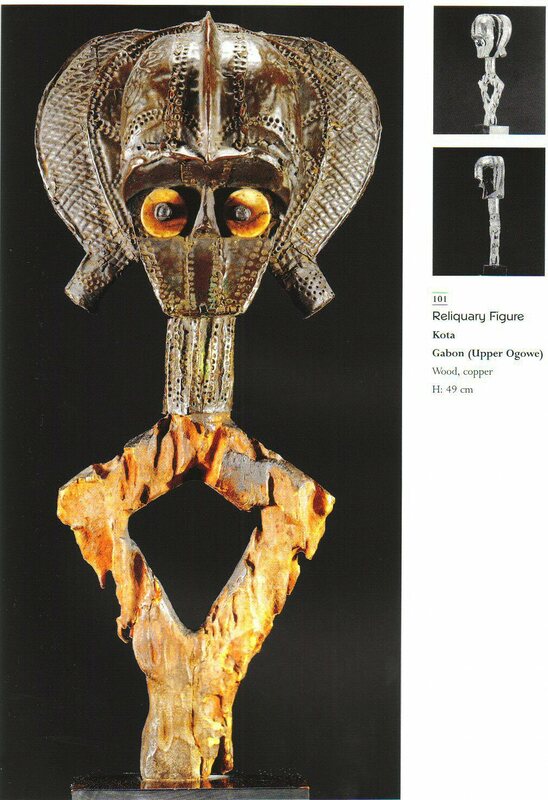 Sale at Sotheby's, London, 3 July 1989.
devotion to relics of important ancestors of the lineage, guarantors for the protection and survival of the group. lineage) and the small (their successors). and rituals involving magical therapy. All such objects disappeared from the villages between 1940 and 1960. Wood, copper; H. 25 cm. 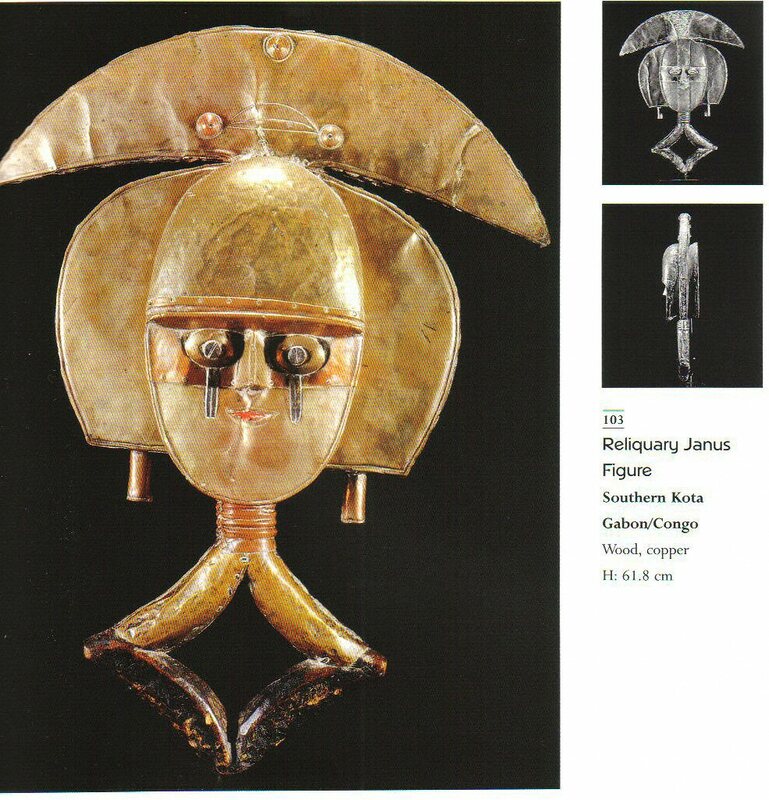 Formerly in the Jacques Kerchache Collection. Dated: late 19th/early 20th century. Le m'boueti des Mahongoue, Jacques Kerchache 1967. - ]. Kerchache, J.L. Paudrat & L. Stephan, L' Art africain, Mazenod, Paris 1988, no. 591, p. 427. 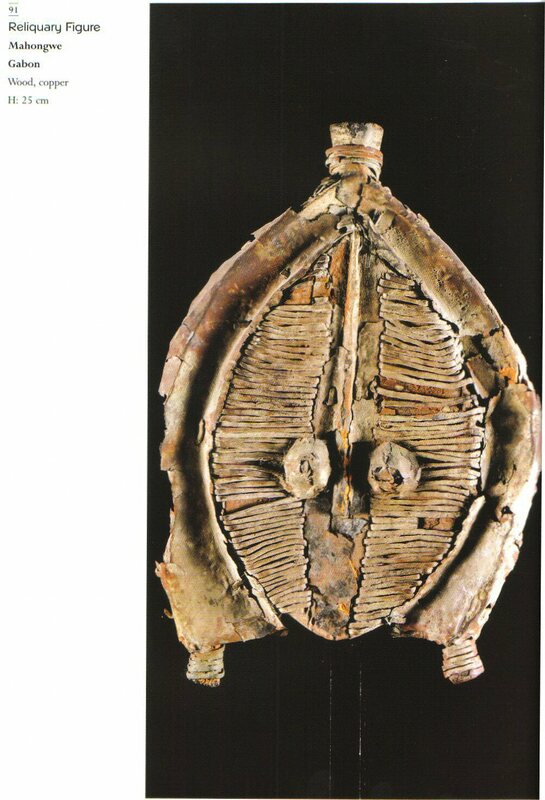 — C. Roy, J. Kerchache, Le m'boueti des Mahongoue, 1967 , p. 67, no. 22. - F. Chaffm, L'Art kota, p. 92, no. 15. 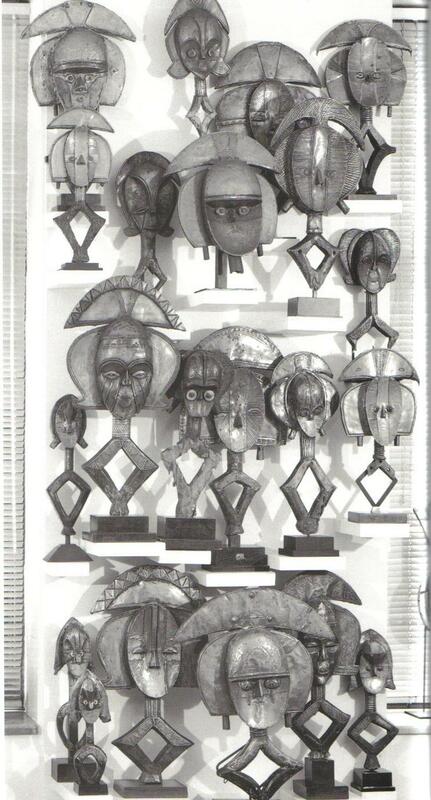 — Arts d'Afrique noire, nos. 5 and 20. Wood, copper; H. 45 cm. - C. Roy, J. Kerchache, Le m'boueti des Mahongoue, 1967, p. 63. Wood, copper; H. 36 cm. Wood, copper; H. 28 cm. Wood, copper, iron; H. IS cm. 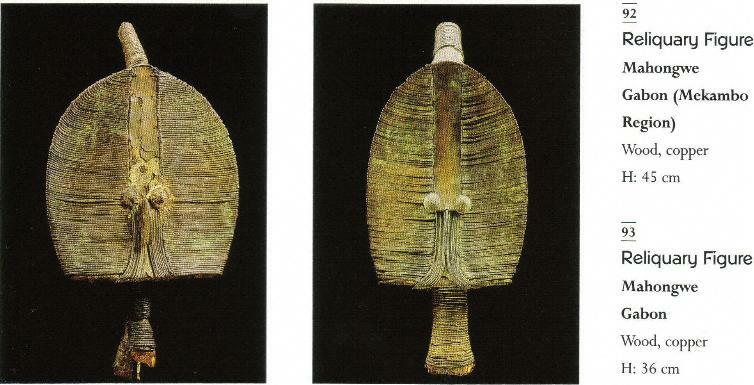 - C. Roy, J. Kerchache, Le m'boueti des Mahongoue, 1967, p. 36-37, specimen 8. - F. Chaffm, L'Art kota, p. 88, no. 12. Wood, copper; H. 43.5 cm. 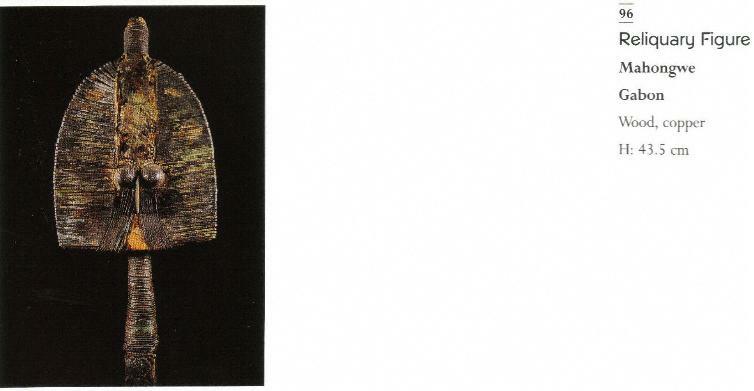 Wood, copper; H. SO cm. 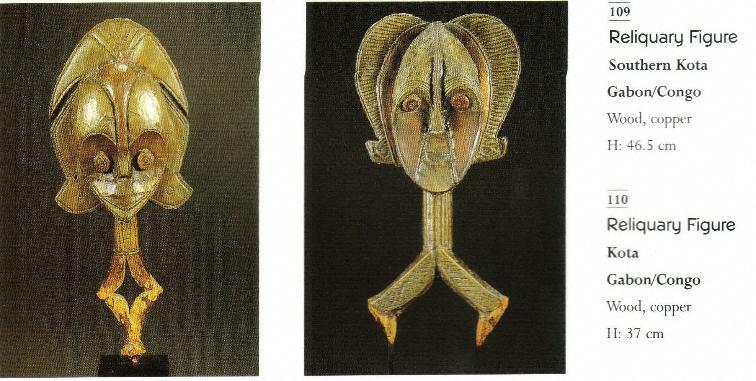 — C. Roy, J. Kerchache, Le m'boueti des Mahongoue, 1967, p. 26, specimen 23. — F. Chaffin, L'Art kota, p. 87, no. 10. Wood, copper; H. 33 cm. Le m 'boueti des Mahongoue, Jacques Kerchache 1967. — C. Roy, J. Kerchache, Le m'boueti des Mahongoue, 1961. Wood, copper; H. 41 cm. to see my Kota "You Be the Judge" page with 22 more figures. CLICK HERE to go to the brief article by Jacques Kerchache on his friendship and experiences with Arman. 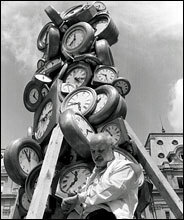 Arman, in 1985, before his "L'Heure de Tous" (Time for All) in front of the Saint-Lazare train station in Paris. died Saturday at his home in New York. He was 76. The cause was cancer, said his wife, Corice Canton Arman. gallery floor to ceiling with rubbish and calling it "Le Plein" ("Full Up"). cast plastic to a 106-foot-high stack of military vehicles embedded in concrete, in Beirut; called "Hope for Peace,"
consumerism, waste and individuality in a society of mass production. 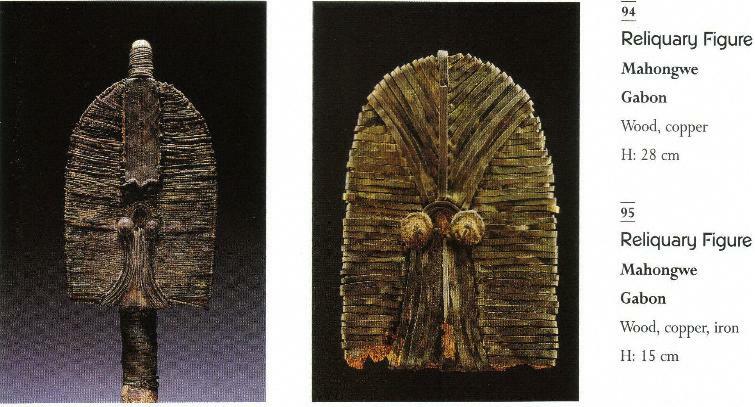 and armor and of African art have been exhibited in museums around the world. archaeology and Asian art at the École du Louvre. and found objects in the late 50's. two years as a medical orderly in the French army in Vietnam. 2001, the Musée d'Art Moderne et d'Art Contemporain in Nice mounted a retrospective. homes and studios in New York and in Vence, France. His first marriage, to Eliane Radigue, ended in divorce. York; five grandchildren; and five great-grandchildren. His son Yves died in 1989.